Salt water pool chlorinators are the popular choice for pool water sanitizing and ensuring a quality, well maintained chlorinator and cell is installed and operating efficiently is essential in achieving a healthy and safe pool. Chlorine output settings and runtime of equipment allows for adjustments in chlorine production. A quality chlorinator will allow the user to increase or decrease chlorine output in percentages with internal timers for runtime changes. Typically as temperatures and pool use increases the need also arises for an increase in chlorine output and runtime. Similarly a decrease in these settings will be needed as temperatures and usage drops. An over chlorinated pool is not healthy and can cause damage to pool surfaces, equipment and cause bather irritations. 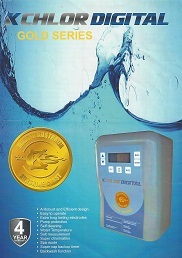 Regularly test the pool water free chlorine readings to calculate adjustments required. While most quality salt water pool chlorinators include self cleaning cells, the regular inspection of cells and chlorinating performance is a must to ensure suitable pool sanitizing and for equipment longevity. A calcified cell will limit or stop chlorine production and can be indicative of poor water balance or end of cell life. The inclusion of salt water chlorinator and cell servicing in a pool maintenance regime will deliver the desired chlorine output settings, extend equipment lifetime and save money in running costs.